Behind the French Menu: Filet Mignon on French Menus and Filet de Bœuf in French Cuisine. Filet Mignon on French Menus and Filet de Bœuf in French Cuisine. rule No 1 is to read the menu carefully. A Frenchman, an Englishman and an American meet in Paris and decide to have lunch together. Without waiting for a menu the Frenchman chooses the best steak dish he can think of and orders a Filet de Boeuf, the Englishman ordered a Fillet Steak; and the American orders a Filet Mignon. The Frenchman and the Englishman are served excellent cuts from the center of a beef tenderloin, large fillet steaks. The American was served a superb cut, but, from a pork tenderloin! He had not remembered rule number 1. Ordering a Filet Mignon in the USA indicates that you want the very best of beef steaks. In the USA a Filet Mignon is the name usually given to the tenderloin, a large muscle that is the most tender of all cuts. Other cuts make great steaks and they may be tastier, but they are not as tender. 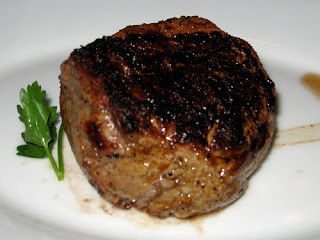 A Filet Mignon is the most expensive cut that most US restaurants offer and it will generally be served with a sauce. The French term Filet Mignon means “dainty fillet” in English. In France, it does not refer to the whole beef tenderloin, rather to the narrow, almost pointed, end of the tenderloin. The thick end of a beef tenderloin, the fillet, in France is reserved for the cuts called a Chateaubriand and a Tournedos. 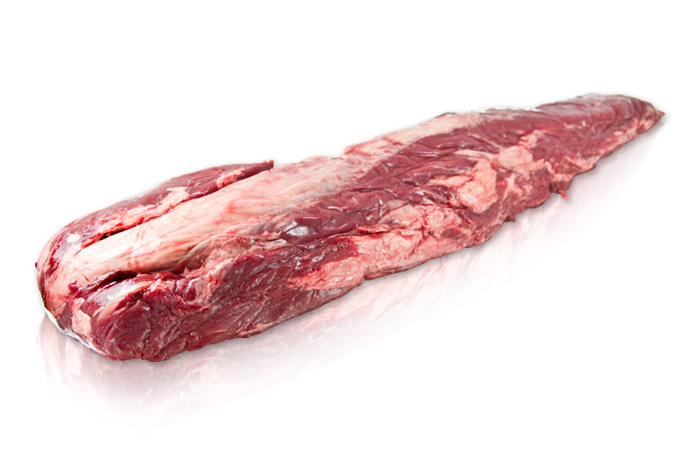 As the tenderloin becomes thinner, about halfway down, the French will cut their Filets de Boeuf, beef fillets. The French beef Filet Mignon is the name given to the last few inches of the narrowest part of the tenderloin. Nevertheless, the term Filet Mignon may be used for a whole tenderloin, but that will be a pork or veal tenderloin! N.B. Confusion for the American traveler in France began in the American kitchen. When US chefs and butchers took French names for their own use but changed their original meanings they omitted to inform would-be travelers. Barded (fat wrapped) Filet Mignons. This cut, even when well marbled, has little natural fat and whether called a filet mignon in the USA or a fillet steak in the UK or a filet de bœuf in France they will be barded, wrapped in fat, before being cooked. Without the barding the steak would dry out. N.B. This cut should never be ordered well done. 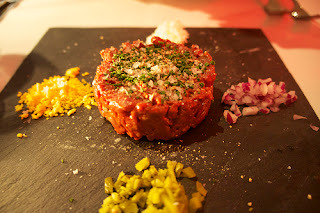 To see the post on ordering a steak in France cooked the way you like it click here. A whole beef tenderloin (without any bone) may weigh anywhere from 1.3 kilos (2.5 lbs) to 2.3 kilos (4.5 lbs). In the USA most restaurants take the whole tenderloin beginning at the thickest end and cut 2" to 2.5" thick steaks until they reach the narrow end. A large sized US Fillet Mignon steak is around eight ounces (225 grams). 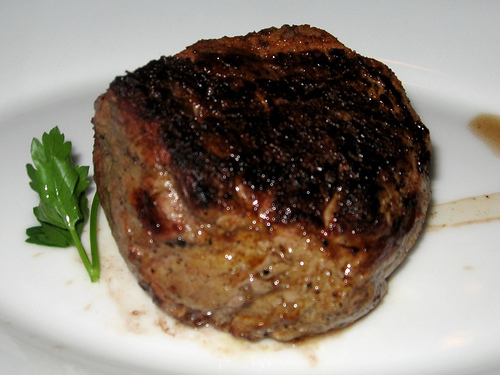 Some North American restaurants offer 10-ounce (280 gram) Filet Mignons. Photograph courtesy of Marx Foods. The smallest part at the end of this cut, on the right-hand side in the picture above, is the French Filet Mignon, the dainty fillet. Nevertheless, cuts taken from here will, in France, rarely be called Filet Mignon, rather they will on the menu as Médaillions, or used for the highest quality Steak Tartar or cut for dishes such as Beef Stroganov. 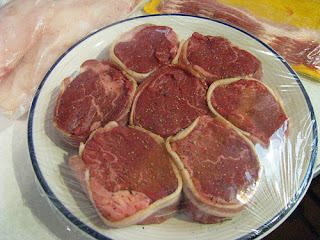 Whole tenderloins of pork and veal are much smaller, and it is for these that the French use the words Filet Mignon. A tenderloin, a Filet Mignon, from an average pig weighs about 500 grams (17.5 ounces, 1.1 lbs), and that is about enough for three people, two if they are very hungry. A veal tenderloin weighs about 700 grams (24.5 ounces, 1.5 lbs), a fair sized meal for three. Filet de Bœuf Poêlé, Jus de Cresson et Pommes Grenailles – A lightly fried fillet steak (tenderloin) served with a watercress sauce and small new potatoes. 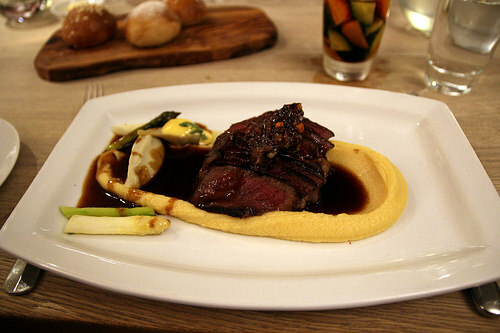 Filet de Bœuf en Brochette Marchand de Vin – A beef fillet cut into cubes and served on a skewer with a Sauce Marchand de Vin; that is a sauce prepared for a wine merchant. A beef fillet served this way allows the use of the thin end of the tenderloin, the French Beef Filet Mignon which may be cut into small pieces. A Sauce Marchand de Vin is made with red wine and beef stock. N.B. The word brochette with two tees may easily be confused with brochet, with one tee, which is pike, the fish. Médaillons de Filet de Bœuf Balsamique – Round cuts from the end of the tenderloin (medallions) served with a Balsamic vinegar sauce. There are cattle feeding lots in France, but they are few and far between. When the beef on your menu is named and it has a Red Label or an AOP then you know it is farm raised. You also know the calves were raised by their mother until they were weaned. The cattle graze freely in the summer and only in the winter are they allowed into barns. In the barns they are fed the same grasses, wildflowers and herbs they grazed on in the summer. French beef will, therefore, be tastier, though it may also be slightly tougher as the cattle will have had more exercise. French beef may be well marbled but overall has less fat than beef sold in the USA. Filet Mignon de Porc aux Pêches, Miel, Amandes et Son Jus au Romarin – A pork tenderloin prepared with peaches, honey, almonds and a sauce made from the natural cooking juices and Rosemary, the herb. Filet Mignon de Porc Jus a l'Estragon – A filet mignon or pork served with a sauce made from the natural cooking juices and tarragon. Filet Mignon De Veau Charolais, Son Jus Aux Escargots Du Brionnais Et Porto Rouge – A cut from a tenderloin of Charolaise veal served with a sauce made from the natural cooking juices and large-sized farmed petit gris snails, from the area of the Saône and the Loire in South Burgundy, and a red Port wine. The AOP Charolaise cattle were the third breed to receive an AOC to protect their provenance and unique qualities. To that French AOC has been added the Pan-European AOP. Filet Mignon De Veau, Fricassée De Rattes Et Eryngii, Sauce Au Vin Rouge Et Morilles – A veal filet mignon alongside a stew of ratte potatoes and farmed King Trumpet Oyster mushrooms served with a sauce made with red wine and wild morel mushrooms. 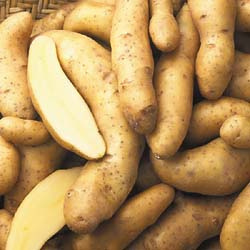 (Ratte are a popular strain of potatoes in France. 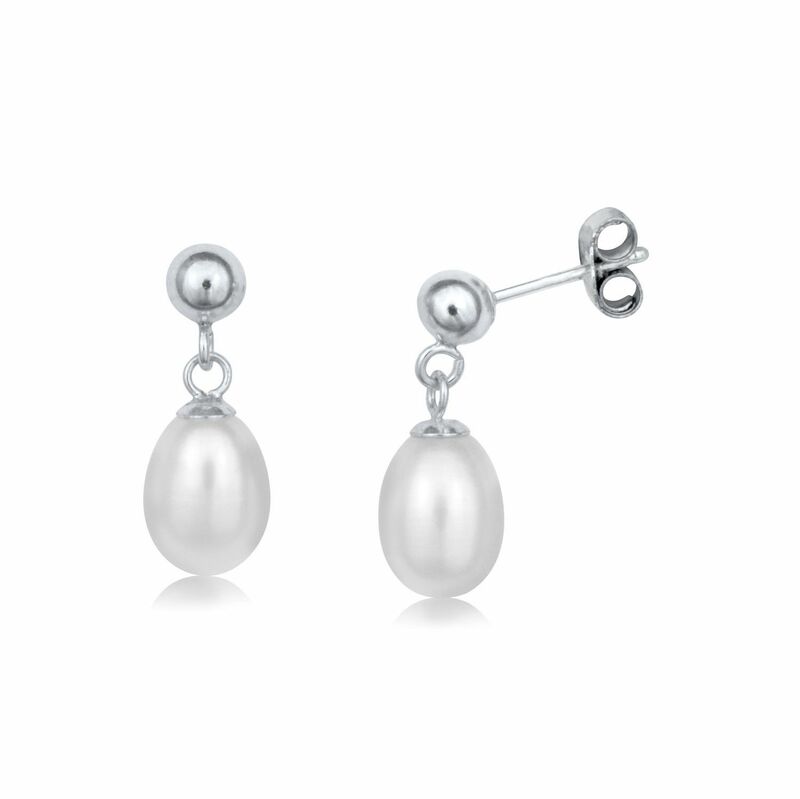 Their name comes from their spurious resemblance to a mouse or a rat; rest assured that their look has nothing to do with their taste which is superb). Another example of confusion with the use of French in the US kitchen is the use of the word entrée. 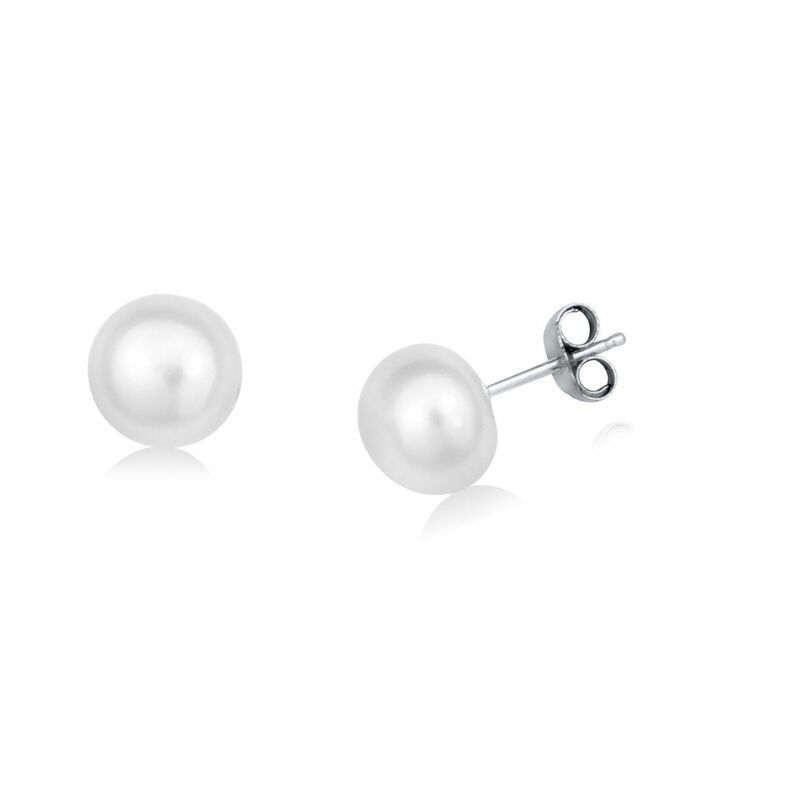 Entrée in French means “the entrance, the beginning.” Following on that entrée in France is used for the first course. In the USA they took the French word entrée and use it for the main course! George Bernard Shaw said: England and America are two countries separated by a common language. However, Shaw ignored the confusion that arises when US chefs and butchers take words from French cuisine and bring them into the American kitchen. (Catalan – llom de bou), (Dutch - ossenhaas), (German – rinderfilet), (Italian - filetto di manzo), (Spanish - filete de lomo ). 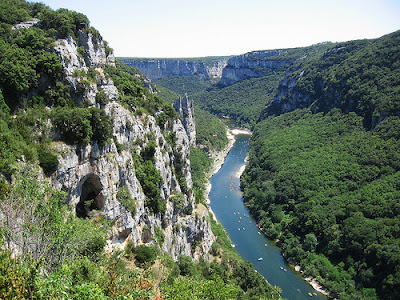 AOC and AOP on France's Foods and Wine labels? Why did the AOC become an AOP? Bœuf Charolais. Le Bœuf Charolais du Bourbonnais AOC. Brochet; Pike, the Fish. Brochet on French Menus. Button Mushrooms - The Champignon de Paris. The Mushrooms of France I.
Chateaubriand Steak and Chateaubriand the Man. Ordering a Chateaubriand steak in France. Cresson, Cresson de Fontaine - Watercress on the French Menu. Jus – Fruit or Vegetable Juice and/or a cooked dish’s natural juices on French Menus. Morille, the Morel Mushroom. Morel mushrooms on French Menus. The Mushrooms of France V.
Poivre - Peppercorns. Peppercorns in French cuisine and on French Menus. For hundred of years pepper was the most important spice in the world. Tarragon, the herb; in French that is Estragon – Tarragon is an Important Herb in French Cuisine and is part of the herb group Les Fine Herbs and Sauce Béarnaise. Tournedos Rossini, after 150 years still the most famous of all steak dishes.